Father's Day is fast approaching, and I wanted to draw something a little different. 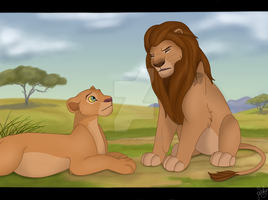 My original plan was to draw Mufasa with Simba, and then maybe Simba holding cub-Kiara - but no. I was struck by an idea of how to sum up poor Simba as a father, and this is it. I know he gets a lot of hate for being over-protective, but hear me out. Simba may be 'that guy' when it comes to possessiveness, but he does it for a reason, and that reason is to protect Kiara. He jumps off the edge of a cliff for her; he allows her to marry the enemy's son because eventually he comes to trust her judgement; his every thought is bent on how to keep her safe. I'm not saying he's 'Father of the Year' - he could do a lot more to keep her happy - but goodness gracious, he sure does try. 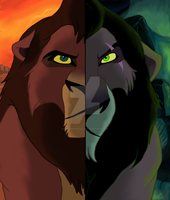 I suppose this also hints at Kovu as a father too - double whammy! I also tried to age Simba a little, giving him lines under his eyes. I hope that shows, at least. 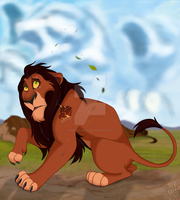 Simba had to take care of Kiara, but kind of failed as a Father, but now he is going to have a tougher time being a Grandfather, if you know what I mean. Simba's expression. Is. The best. Ever. On the contrary, I think Nala would be bouncing around in excitement at the prospect of becoming a grandparent, probably asking Kiara how many cubs she's going to have and if she came up with names yet. I agree - I feel like she would be the happiest lioness on the planet! 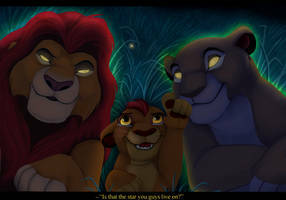 I just LOVE Simba's expression, and Kiara is so cute too chat's your vision of Kovu and Kiara's cubs ? do you think they'll have one, two or three cubs ? That's the reaction that most fathers would have in that case You did good with this one! Simba's face is priceless! Ha! Well, love did find a way, after all. I hope my Dad reacts like that. My dad will probably kill me and my significant other. Ha-ha!!! All dads with daughters have been here at least once in their lives. 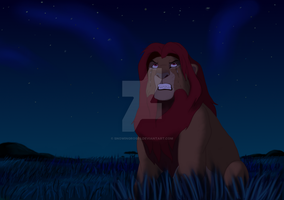 I laughed harder at Simba's face than I should've XD Fantasic job! Well Simba, what do you expect, she's married now. XD oh god I can see this happening hahahaha! I accidentally found that Kiara and Sarafina look a lot a like. Just something to think about. I've seen a lot of drawings where she looks like Nala as an adult, so I figured I'd try that out, but it didn't work for me. So it might be worth a try to draw her like Sarafina? I always thought that she and Nala looked very little alike facially (except maybe the chin?) so I think you're right, it might be worth drawing her like Sarafina. I think it might be the eyes; Sara's and Kiara's are open whereas Nala's are usually half closed. I was playing with bases when I discovered it! I was using Sarafina's lines but I wanted it to be Kiara so I figured I'd just make do and It turned out they resemble each other quite a bit.